Chelsea Nellist characterizes each of the states through major cities, landmarks, state symbols, and slogans. Whether you're California dreamin' or you're in a New York state of mind, Chelsea Nellist's typographic portraits are charming tributes to your favorite state. Her expressive hand lettering fills the borders of each state with the names of its major cities, landmarks, state symbols, and slogans, making them graphic celebrations of your home state or one that's close to your heart. Digital print from Chelsea's original artwork. Available framed or unframed. Made in Oregon. 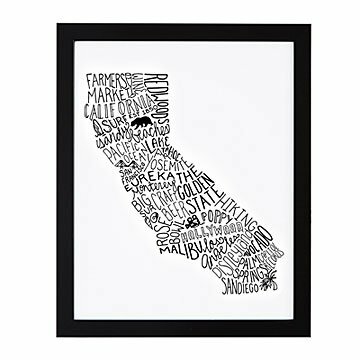 Click here to see all available State Typography Art. Growing up, Chelsea Nellist expressed her creativity through art, crafts, music, and anything else she could get her hands on. Somehow, with every avenue leading her toward a creative lifestyle, she ended up in finance. But building colorful spreadsheets only takes her so far. Chelsea started creating drawings on the side—first as gifts for family and then as artwork for sale. Soon, this sideline grew into an entire design business. When she's not illustrating, Chelsea enjoys spending time with her husband, James, her two boys, Xander and Brixham, and her Italian greyhound, Twiggy. The print arrived in perfect condition, and looked even better than the product image!